46% of American museum boards have no trustees of color. How can boards become more diverse? The Chronicle of Philanthropy recently reported that a $4 million grant has been issued to the American Alliance of Museums (AAM) to actively work toward making museum boards more diverse. This is a challenging, but necessary task. In their first study of museum boards “Museum Board Leadership: A National Report 2017,” the AAM stated that 46% of American museums boards are completely white. 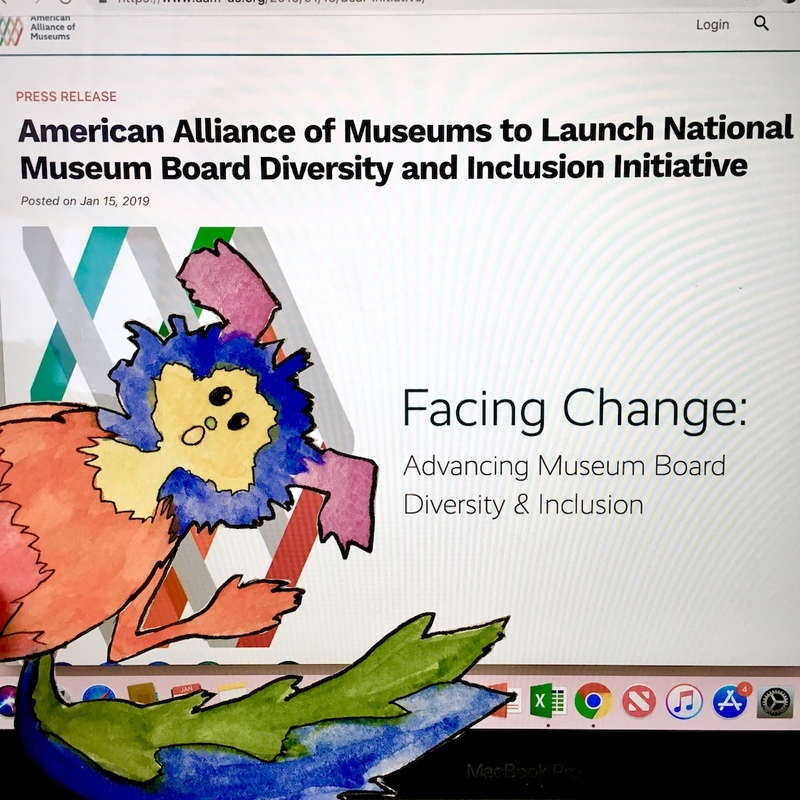 One of the survey’s major findings was, “Museum directors and board chairs believe board diversity and inclusion are important to advance their missions but have failed to prioritize action steps to advance these priorities…only 10% of directors indicate that their boards have developed a plan of action to become more inclusive. ” The $4 million grant, jointly provided by the Ford, Andrew W. Mellon, and Alice L. Walton Foundations, will fund AAM efforts to consult with and support museums in the move toward board diversification. Money: A number of museums have annual board giving minimums that cannot be met by the average or above-average income person. Not only are board members expected to financially support the institution themselves, museums want their boards to court their affluent friends to support the institution through annual gifts, special events, and/or sponsorships – either individual or corporate. Obviously money is one of the biggest barriers to entry and goes beyond race and class. Money also excludes so many perspectives that are needed on a museum board, including those of educators, artists, activists, and members of a museum’s surrounding community. A Mellon Foundation survey from 2015 found that the employees of museums (never mind the board) don’t accurately reflect a museum’s community and neighborhood demographic. Board members all too often represent industries that benefit from exploiting lower and middle income communities, including real estate and pharmaceutical. Nepotism: See above. Museum board members can invite friends to join a museum’s board and benefit from the tax breaks and good PR for the family name. Oh yes, and of course White Supremacy: Fear and uncertainty surround the idea of sharing the reins of influence and decision making with people who may want changes made to institutional messaging, hiring practices, and exhibitions. Adding new perspectives could even challenge what existing board members represent. When evaluating museum boards, race is just one of many factors that need to be addressed. Marabou knows that if the AAM were to further dig into their data they would find that a high percentage of American museum board members are cis, straight, able-bodied white men (wealth goes without saying). However, this should not take away from the fact that the AAM called out a major problem in American museums and is actively doing something about it. The AAM’s plan is called “Facing Change: Advancing Museum Board Diversity & Inclusion,” and, according to the AAM’s press release, “will provide the framework, training, and resources for museum leaders to build inclusive cultures within their institutions that more accurately reflect the communities they serve.” There are multiple facets to the program, one of them including a board matching service where the AAM will connect museums with people who are interested in being board members and who may not have access to express interest, apply, or be considered for a board position. The AAM will also provide diversity and inclusion trainings and an online resource center. The one element that doesn’t seem to be addressed in the AAM’s new plan is the emphasis on money and the ability for board members to fundraise. Although board minimum giving and fundraising isn’t necessarily a requirement for all museums and all board members, it can be a way for museums to explain, and possibly justify, why wealthy white people are a board’s majority. As the AAM starts work on reimagining what a museum’s board of trustees can look like, Marabou offers this one possible solution for the money question: Why not use some of the board’s donations to create one or more endowed board seats, just as there are endowed professorships at universities. For this board seat, the expected board giving is covered by the endowment. Perhaps this structure or something like it is already in place. If so, let Marabou know! What are other ways to balance a museum board’s financial duties with the need to have better representation? How can we reimagine museum governance so that it doesn’t involve prioritizing money and power?